Welcome to Magnus and Charles Tait's archive of the Ba' Game. The Ba' is played every Christmas and New Year's Day in Kirkwall, Orkney. 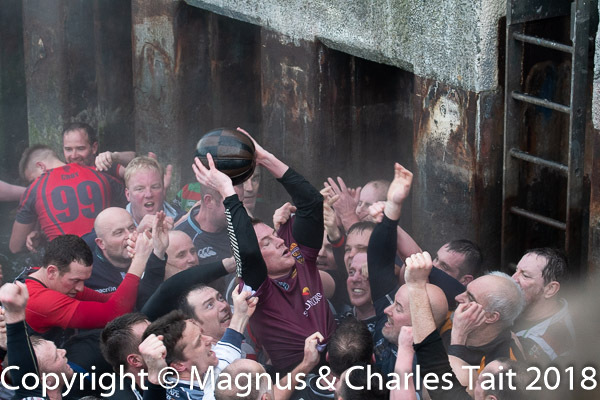 This traditional game of mass football is played in the streets of the town between the Uppies and the Doonies. For more details about the history of the game click here. Charles Tait has been covering Ba' games online since Christmas 1997 and photographically since New Year 1977. Images and reports from this season below will be available to view after the games. 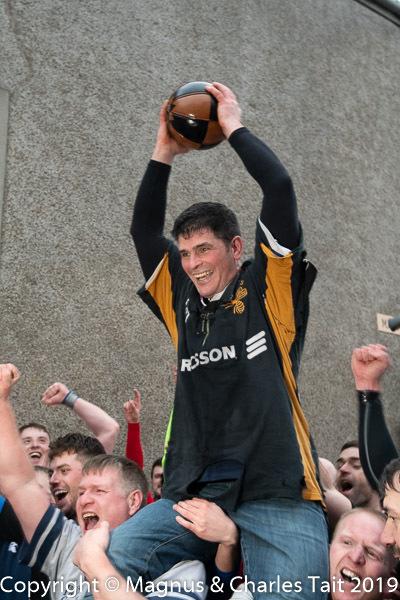 The 2015 Mens' New Year game was the 76th to be covered by Charles Tait. To see the full list of games covered click here. The forthcoming book,"The Ba' - Uppies v Doonies" will have a large selection of images from all of these games. All of the images on this site are available as prints - to order please quote the number on the left of the caption of the form X2000-1234. Orders may be placed by email, phone or fax. The standard size is 5x7in, although other sizes are available. Images are also available for reproduction - please quote year (e.g. NY2000) and number or caption.